Just ordered my copy of the 3rd Fashion Revolution fanzine. I use the first one as a key teaching resource, with its fashion diaries. This one looks rather useful - here's the description. On 28th August, Fashion Revolution is launching the third in a series of its bi-annual collectable fanzines which seek to uncover the stories behind the clothing we wear. Pre-order your copy below. 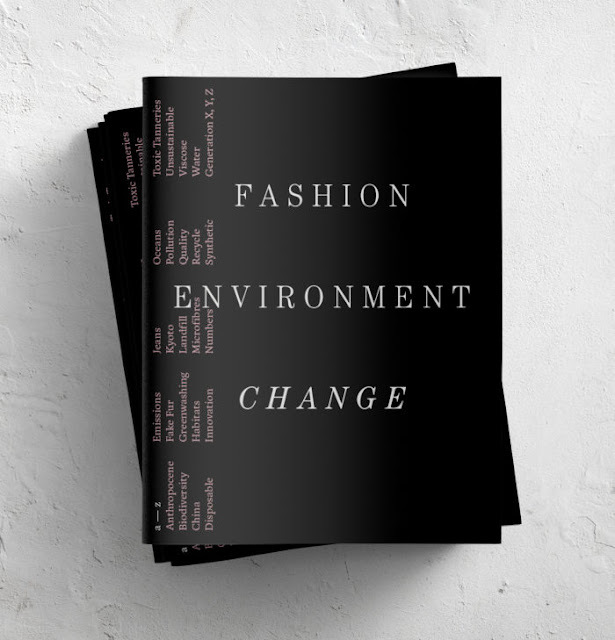 FASHION, ENVIRONMENT, CHANGE is an A -Z of the fashion industry’s thorny relationship with greenhouse gases, ocean plastics, and textile pollution, from the Anthropocene to Generation Z. In order to make change, we need to understand the problems and find creative ways to change systems and human behaviour. The Graphic Design students of Central Saint Martins have created thought-provoking illustrations and visuals to give a fresh perspective on the carbon footprint of a pair of jeans; the corrosive pollution created by the textile factories of Erode in India; and why shoe and bag brands need to get to know their tanneries. A team of experts, writers, poets and campaigners examine how fashion can lessen its impact on the planet for future generations. Contributors include Dilys Williams, Linda Greer, Wilson Oryema, Orsola de Castro, Scarlett Conlon, Jake Hall, Tamsin Blanchard, Carry Somers, Sarah Ditty, Fleur Britten, Matthew Neadham and Arizona Muse. The proceeds of this non-profit fanzine will go towards creating more inspiring and informative resources like this zine in the future and helping to grow the Fashion Revolution movement.